OPIE is one of the largest exhibitions in Japan specialized for the photonics industrial sector. It takes place at the end of April when a new fiscal year starts for most of companies and it has been regarded as the best opportunity for visitors to be here looking for “what’s new this year” and trend of technology related with their research, development and design activity. It is the largest exhibition which has been held with international academic conferences on laser and photonics fields in Japan and top level scientists and engineers from university and companies visit to exchange information. OPIE stands out for the major international exhibition by cooperation with various associations for optics and photonics representing for their countries including SPIE, OSA and CIOE. There are few voices from the visitor survey that there is no difference compared with other exhibitions, and many visitors have appreciated the features of OPIE at this time. We aim to become the largest photonics exhibition in Japan and we try for the themes to this purpose. Exhibitions operated by The Optronics Co., Ltd. are not co-located with exhibitions that have the theme of general electronics as seen in other exhibitions. Visitors will come for the theme related to photonics, positioning and medical. It is one of the features that there are many visitors with concrete subjects. Most of the exhibitors have said that quality of visitors is high. In addition, by holding highly specialized seminars, engineers who are active in various fields of optical technology have been mobilized and most of them visited with tasks and subjects in line with the theme of the exhibition. Approximately half of exhibitors are appreciating that the seminars are effective. As a result, each visitor’s staying time was long and more than 12% of those visited for more than two days. We saw the exhibitors had meetings directly connected to their business at their booths. 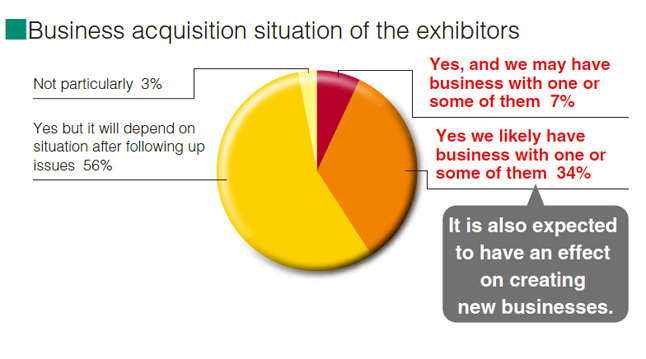 According to the survey result, over 40% of exhibitors have got purchase orders at the booth or they likely would have orders, and 97% of exhibitors felt a good response with business opportunities.